Today we went on a 3-hour boat tour to see whales and dolphins. 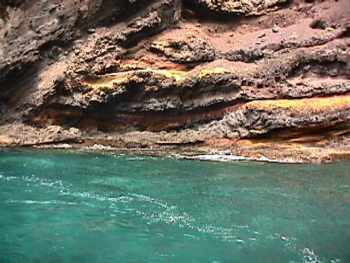 The trip included a stop in Masca Bay for a swim and lunch. We had booked the trip a few days earlier with the boat that takes the university research team out to study the large sea mammals. They gave us some excellent booklets about pilot whales, dolphins, and sea turtles, so we were well-informed. We chose the right boat. Our captain found the whales and we had lots of time to watch them in peace before they shared the news with other boats. You can see the whale's blowhole to the left. 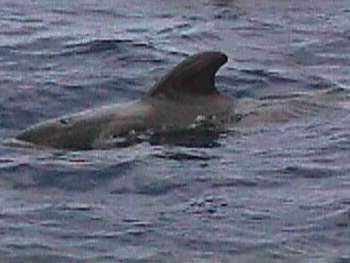 The whales can be differentiated by the shape of the fin. One of the crew was taking photos for the university. 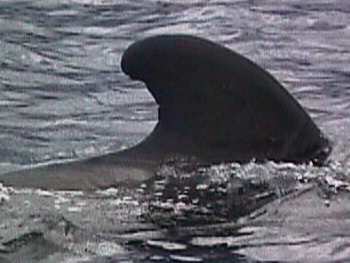 Here is a close-up of another whale fin. To the right you can see the spray from the whale breathing. The fin is different so this is a different whale from the photo above. There were about 15 whales in the pod. They came right up to the boat and seemed to be quite curious. Our captain was careful to go slowly and not scare the animals. The other boats were not so considerate and came racing in to see the whales. Here come the other whale-watching boats. You can see 2 whales between us and the schooner. The coast behind stretches from Los Gigantes on the left to Puerto de Santiago behind the boat to Playa de la Arena on the right. 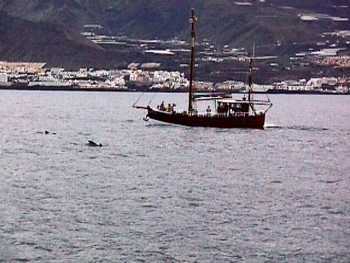 When the other boats came, we headed north to look for dolphins. 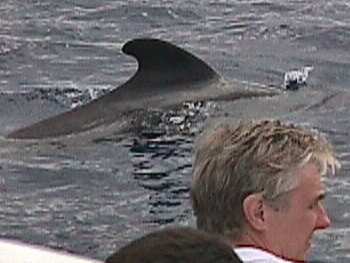 And we were really lucky and found dolphins too. Here is a mother with a baby beside her. 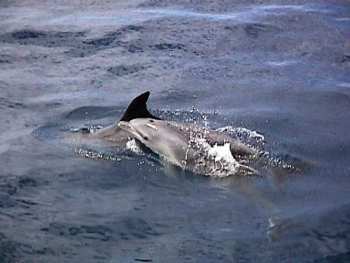 Here is a better photo of the baby dolphin, closely following its mother. Like the whales, the dolphins did not seem at all frightened by the boat and swam around and under it for several minutes. There were about a dozen dolphins in the group. 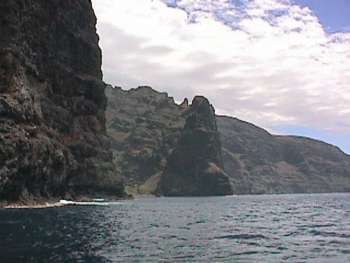 The Los Gigantes cliffs just north of Masca Bay. You can see how the weather has improved from dark clouds and rain to blue sky and sunshine. We were very lucky. 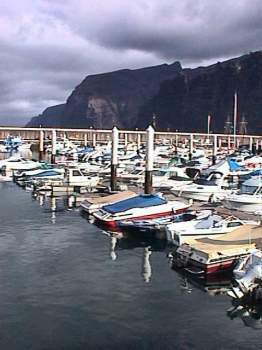 This is Masca Bay where we are going to anchor, have a swim and have lunch. Behind is Masca Barranca. We had planned to hike it but decided it would be too difficult. After my hiking boot lost its sole, it was impossible. 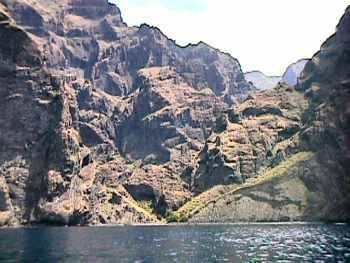 We picked up some hikers who had come down the gorge and took them back to Los Gigantes. Otherwise they would have had to hike back up to the town of Masca. 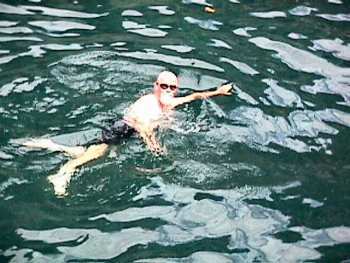 Bill swimming in Masca Bay. I did not go in. Bill said it was warm but his thermometer is on a different scale from mine. The water was very clear. The boat had a glass "window" in the hull and I watched fish swimming around the boat. Then we all enjoyed a delicious paella for lunch. From a distance the cliffs look dark but up close the lava is as colourful as up on Teide. 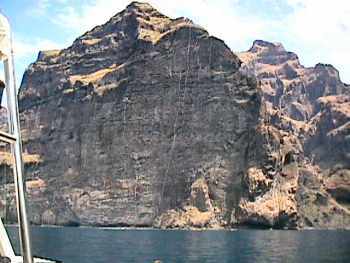 These rocks are just above where Bill was swimming in Masca Bay. 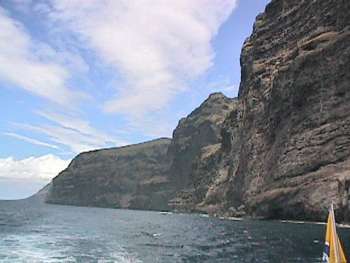 Los Gigantes cliffs, looking north to Punta de Teno. Los Gigantes cliffs looking south towards Los Gigantes town. We are heading home after a very successful outing. 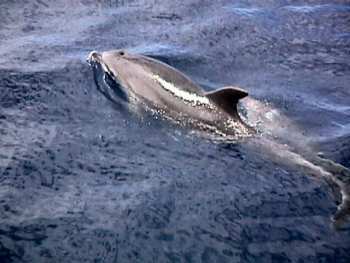 When we arrived back in harbour we got a photo and a certificate that we had seen pilot whales and dolphins (Tummler in German; I must find out what kind of dolphin that is in English).